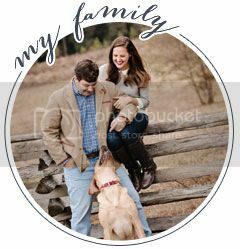 Today I am so excited to have my bestie Mary Catherine of the fabulous Cotton & Quill over on my blog! We have been friends since middle school and I am so excited to see her fabulous brand expanding everyday! She is such a gifted designer and her textiles and stationery are absolutely fabulous! She is most definitely up and coming! 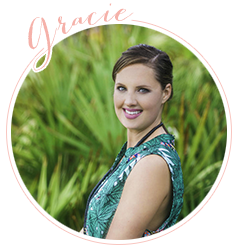 While Gracie, one of the most fashionable and entertaining person I have ever had the pleasure of knowing, gives us all a daily dose of what's trending in fashion, beauty and Southern living, I am here to offer a little dose of what's trending for the home. 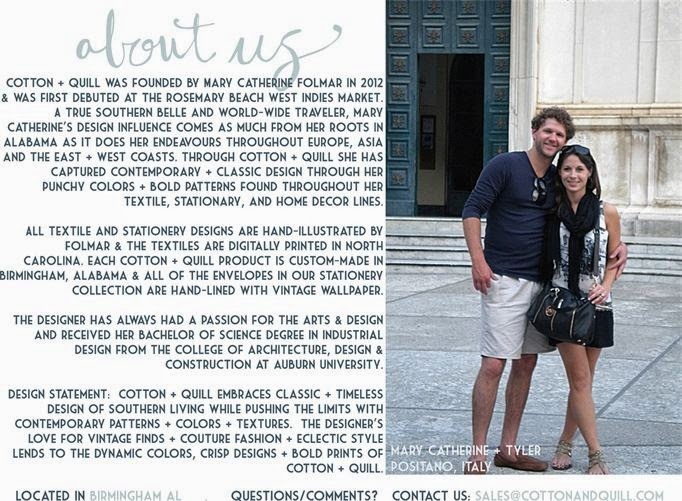 For those of you who don't know me, I am the founder and principal designer for Cotton + Quill, a custom textile and stationery company out of Birmingham, Alabama, so I have become quite familiar with how to make current trends work in your home. Tommy Mitchell has some absolutely GORGEOUS painted and gilded botanicals. Try hanging them in a set or just sitting them on a side table. 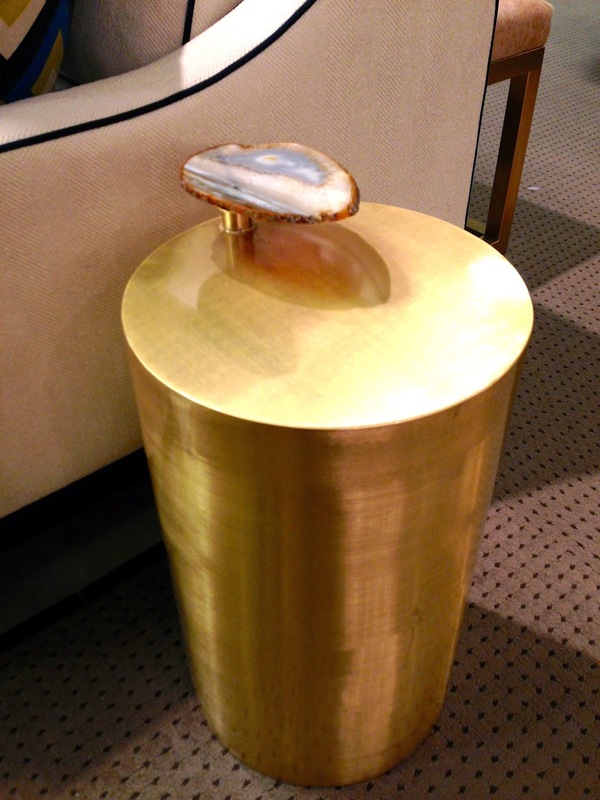 I made sure to snag one of these lovelies by Taylor Burke Home while at High Point Market. While these goods are offered to the trade, I will be happy to work with anyone interested in purchasing their gorgeous goods! Asian influences are hot, hot, hot! This is a sneak peek of the revitalization of a historic American Bungalow project I am currently working on which I have been featuring on my blog, Quill Notes. 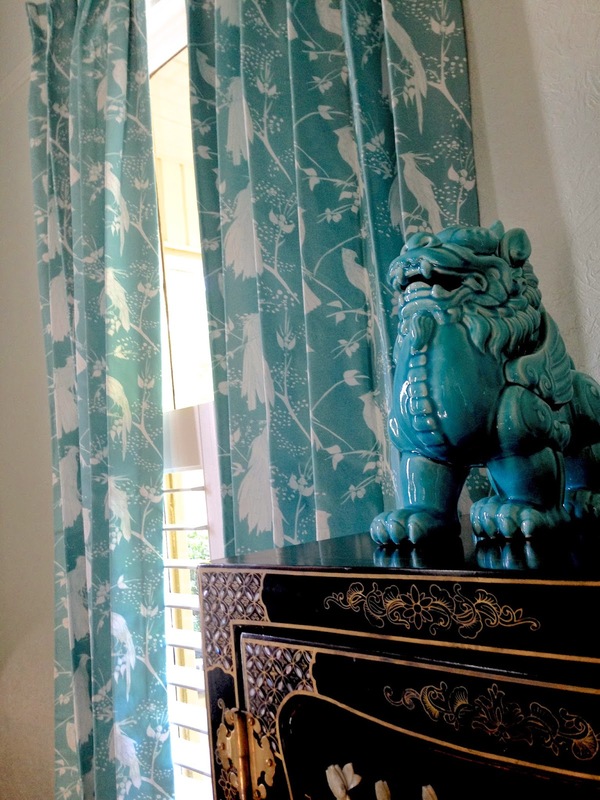 The client already had this gorgeous black lacquered chest with oyster and gold details, and then we found a pair of foo dogs, which is a MUST in every home, and draped the windows with custom drapes in Cotton + Quill's Cuckoo pattern from the Terrace Collection in a custom turquoise hue. 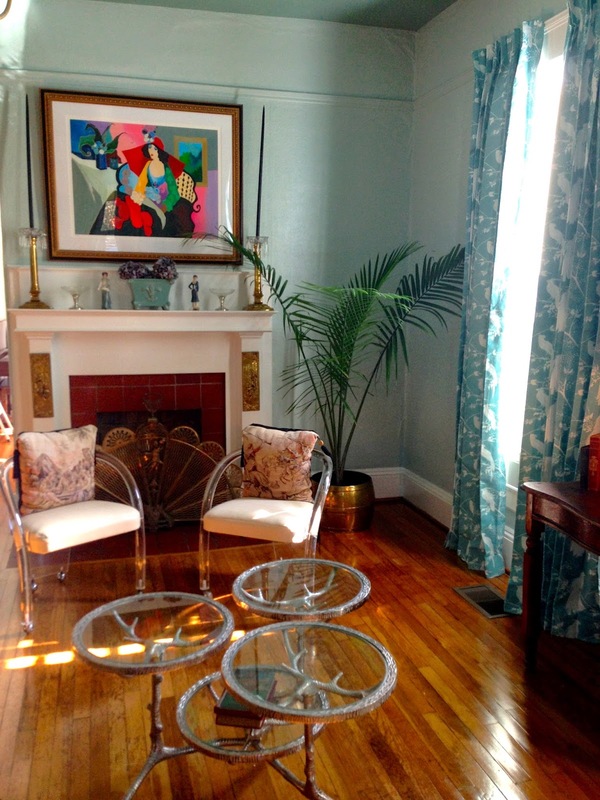 Shown here is another view of how I incorporated Asian influences through the use of Cotton + Quill's Cuckoo drapes with a pair of the client's pillows made from her grandmother's tapestry. Also, you will notice a hint of brass in the peacock fireplace screen, candlesticks and embossed plates on the fireplace. 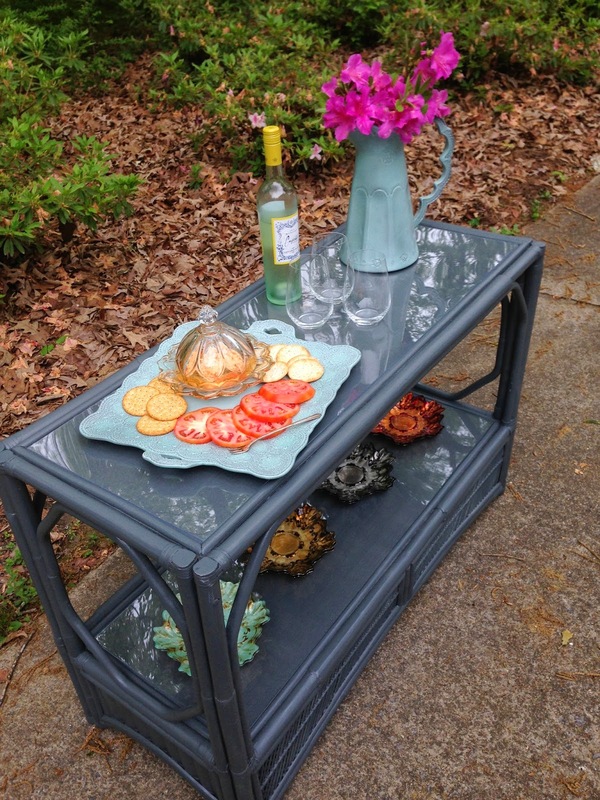 Many of these items we found from estate sales, thrifting and antique malls. If you don't have the time to get out try eBay or etsy. This is an excellent example of mixing brass and Asian influences. 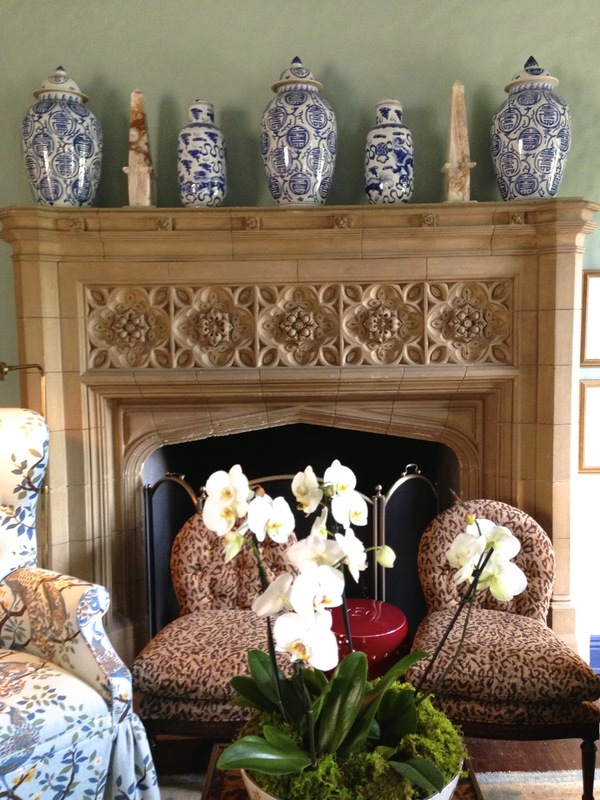 Always classic is blue + white....You simply cannot beat mixing varying sizes of blue + white urns on top of the mantle....also try hanging a few blue + white plates and platters. Here I used by letter pressed wedding invitation as the centerpiece surrounded by blue + white plates and chinoiserie urns atop a pair of decorative wall brackets. Custom drapes in Cotton + Quill's Capri pattern soften the space. 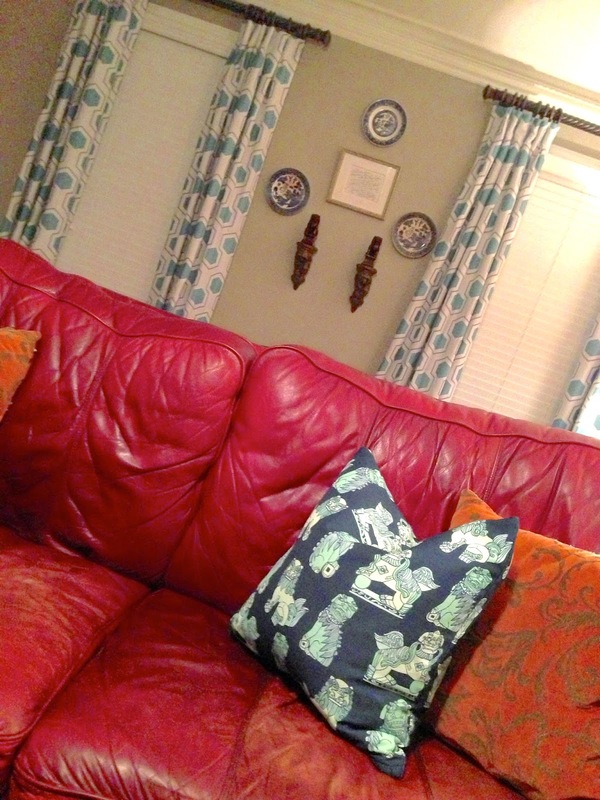 I had to be extra creative when deciding my decor around this bold red leather couch....and lucky for me, hues of blue were the perfect fit! This is another view of the custom drapes using Cotton + Quill's Capri pattern with a throw pillow in Cotton + Quill's newest Shishi pattern - a whimsical take on the traditional foo dogs. 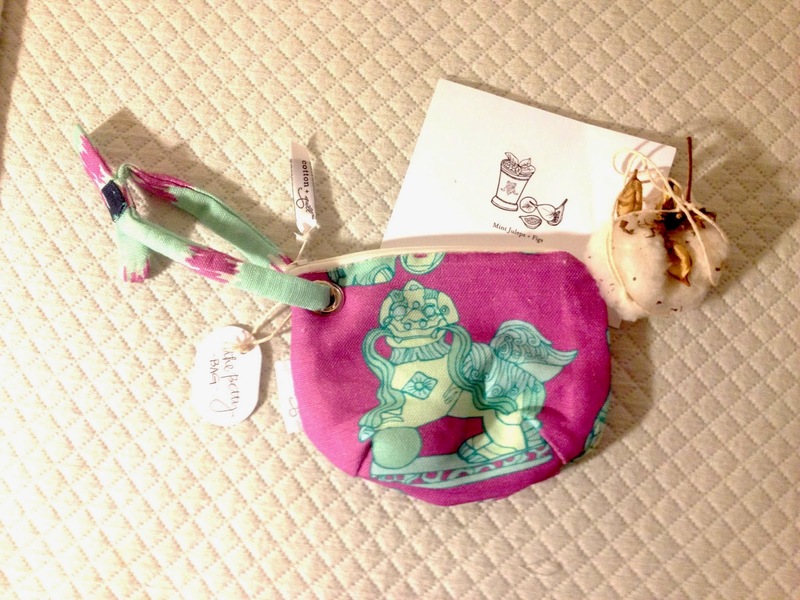 And I must say that Cotton + Quill's Shishi pattern has been HOT!!! this season. Lucky for you....if you don't need a pillow or drapes, Cotton + Quill also offers lovely Cotton + Voile scarves in their newest Shishi + Cuckoo patterns! 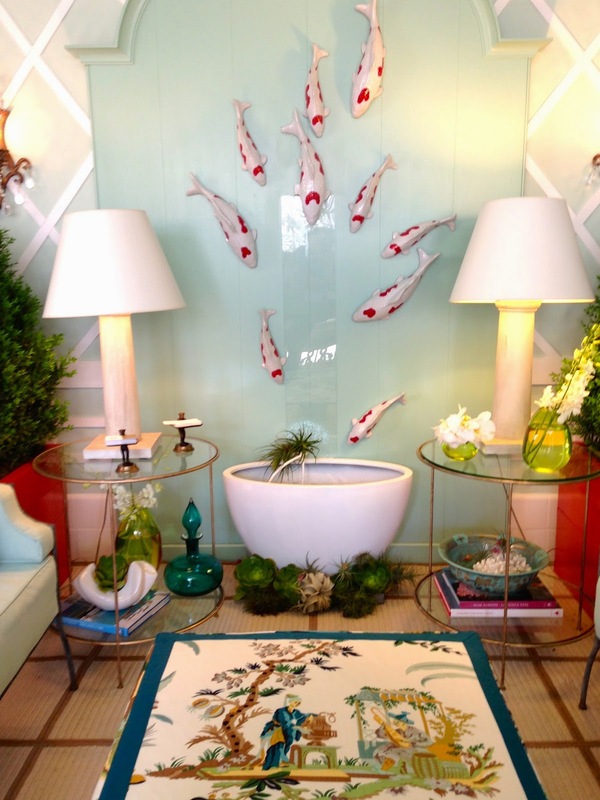 Lastly, another chic look to include in your home is a lacquered piece. You saw earlier how my client for the American Bungalow had her own Asian black lacquered piece, but you can also create your own lacquered piece with Amy Howard's spray paint lacquer.....I used La Grange for this fun piece....full DIY on the Quill Notes blog. I hope you have gotten a little inspiration for how to spruce up your home and now you know where to visit for more tips on the Quill Notes blog!! I am so excited that we are going to be giving away her fabulous Betty Bag. Just follow the rules on the rafflecopter. Giveaway ends 5/6 at 12 AM . Thank you for asking me to be your guest blogger for the day!! So much fun! I have nominated you for The Leibster Award, hope you enjoy the questions.